With traditionally cooked burgers, it is very difficult to gauge doneness. Low density means rapid overcooking and a relatively thin profile means that it's difficult to judge where to stick a thermometer. With precision cooking, you can nail that perfect pink interior time after time. 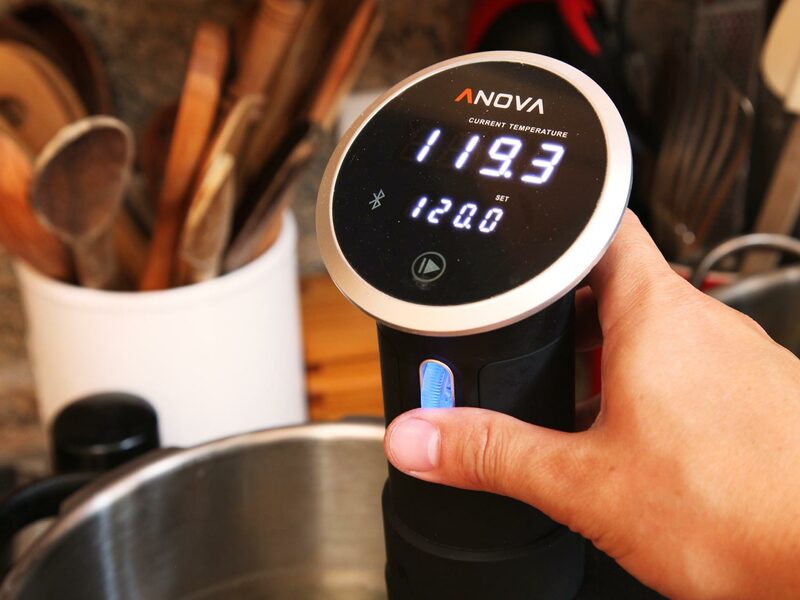 Pre-heat your Precision Cooker to the desired final temperature according to your preferred finished texture, included here and in the app. 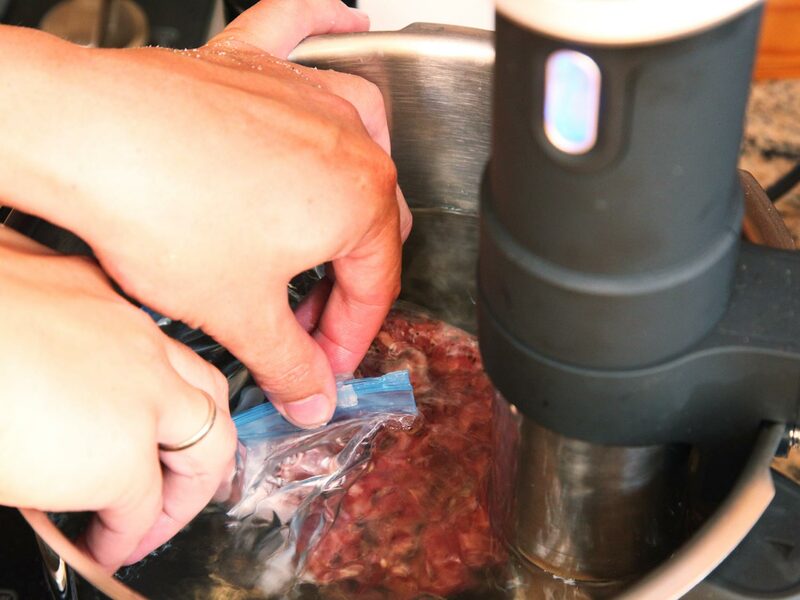 Allow the water to come to temperature before adding your burger. 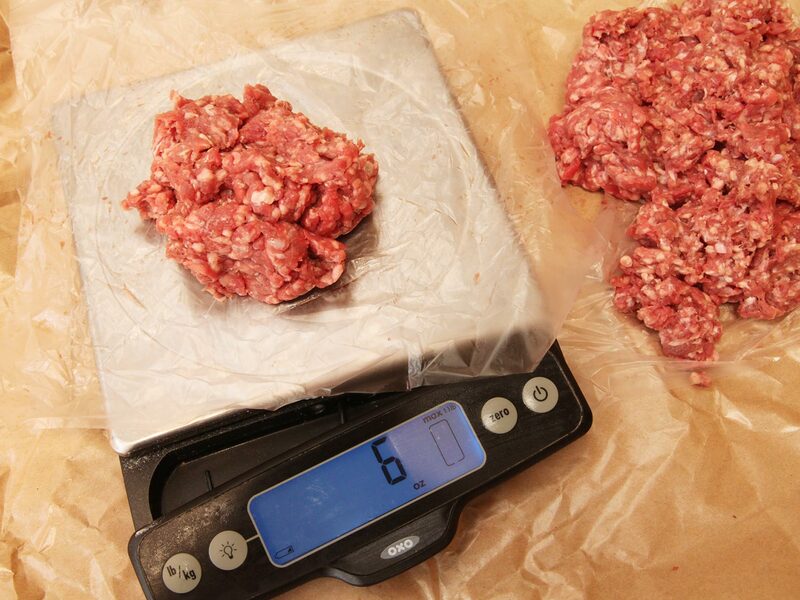 Weigh out your ground beef into even piles of 6 to 8 ounces / 168 to 224 grams apiece. 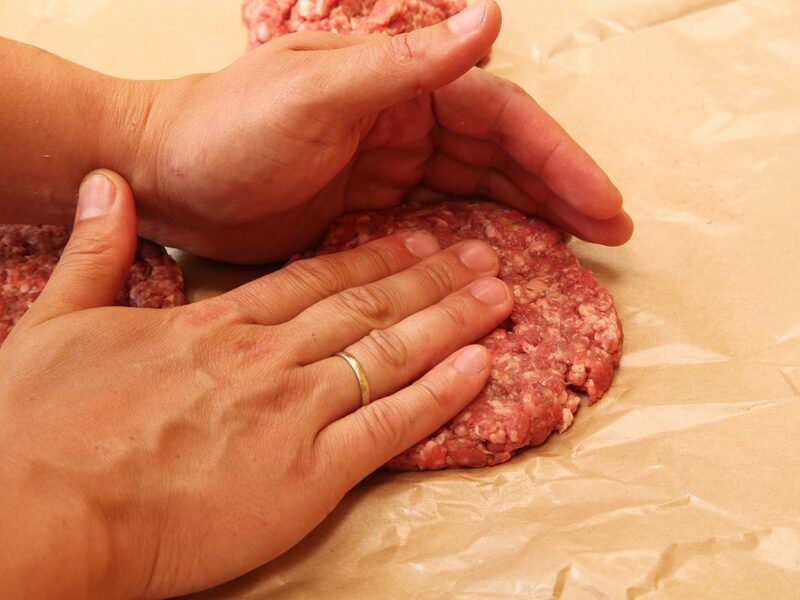 Shape your burgers by gently tossing the meat between your hands until it barely sticks together. 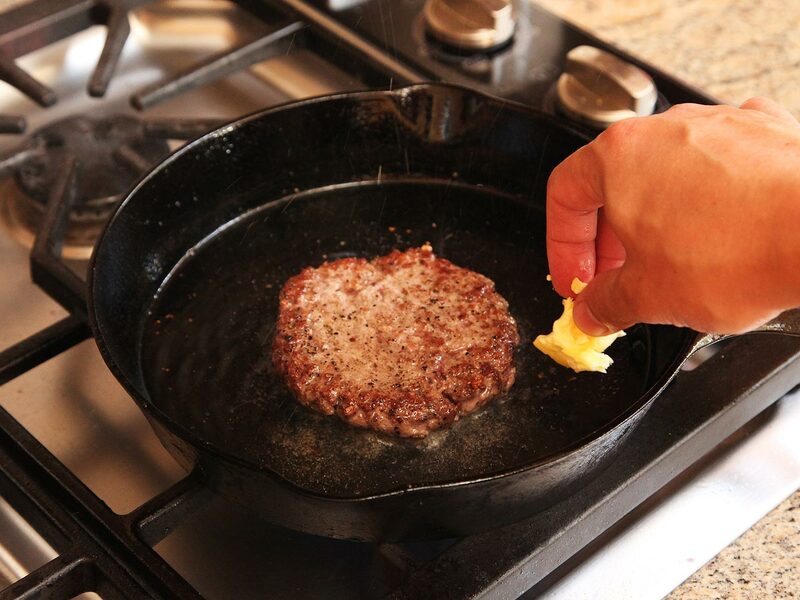 Place it on a flat, clean surface, and gently press the burger into shape using your fingertips. Do not overwork the meat -- press just until it sticks together. 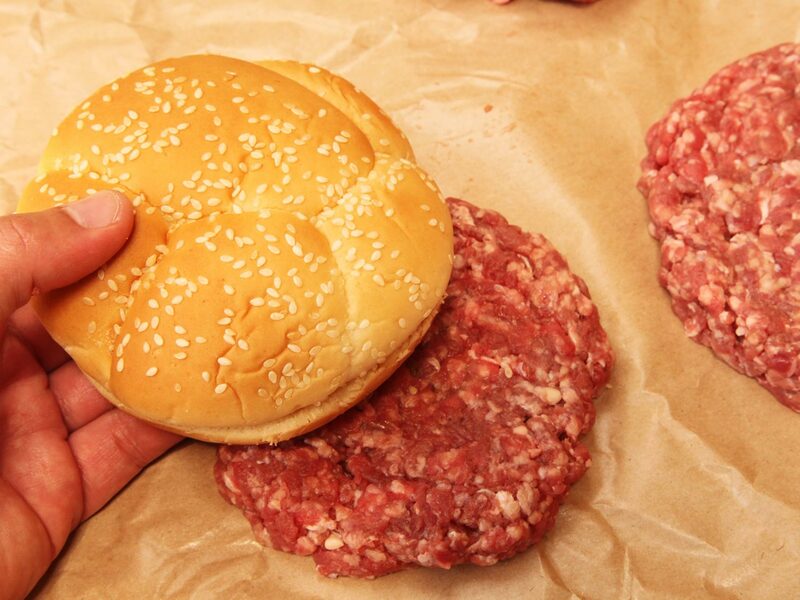 Check the size of your burger by comparing it to the bun (make sure to wash your hands before picking up the bun and do not let it come in direct contact with the raw ground meat). The patties should be half an inch / a little over a cm wider than the bun on all sides. 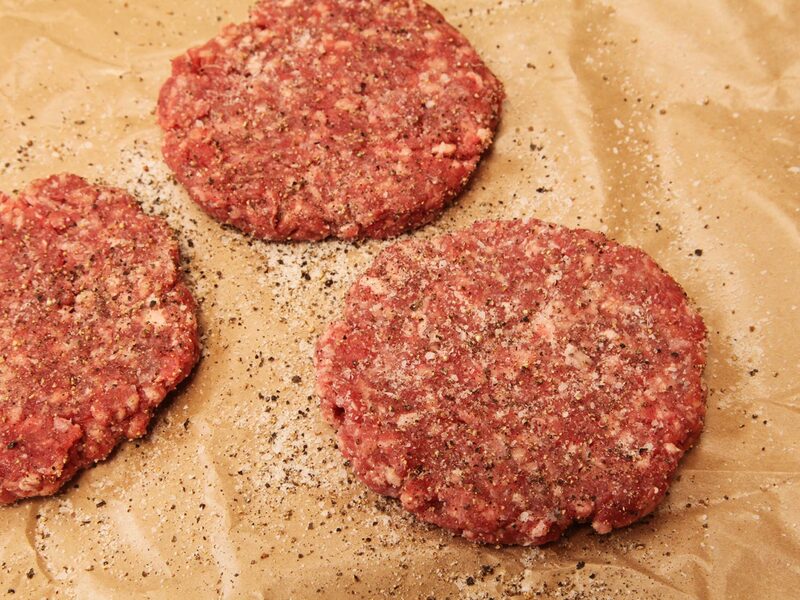 Season the burgers generously on both sides with salt and pepper. 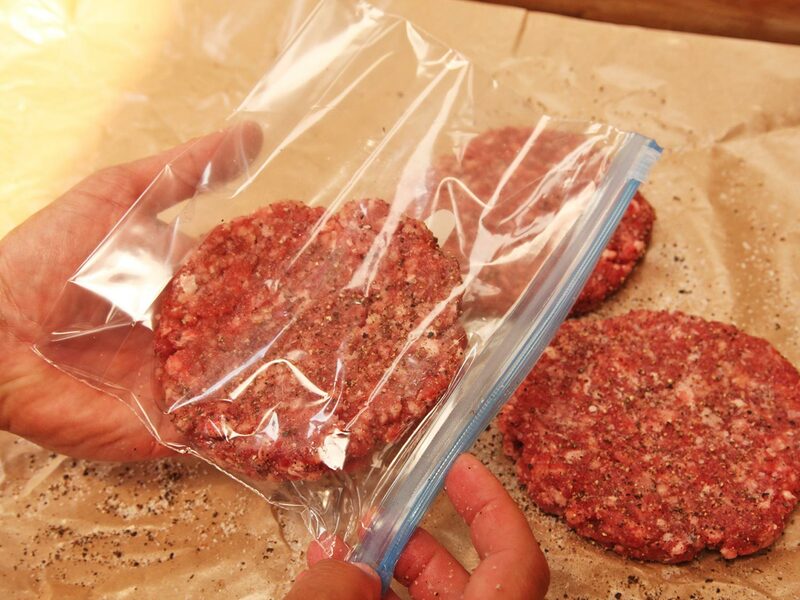 Place the burgers in individual zipper-lock bags and seal, leaving a 1-inch / 2.5-cm opening in each bag. Seal the bags using the water displacement method: remove as much as possible by hand, then slowly lower each bag into the water bath, letting the force of the water press any excess air out through the one inch opening. Seal the bag just before it becomes submerged. Cook the burgers according to the time and temp provided for your desired level of doneness. 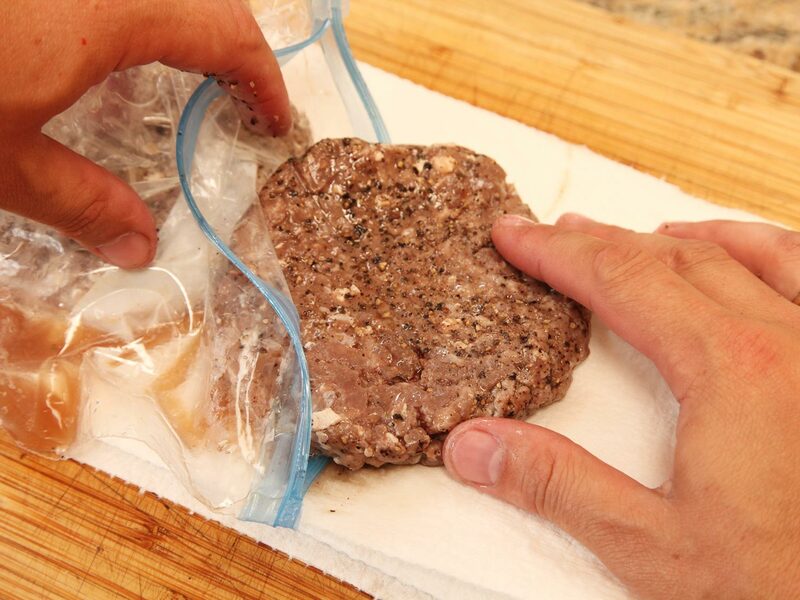 Remove the burgers from the bag and place them on a paper towel-lined plate. Pat them dry very carefully on both sides and season with additional salt and pepper. Let the burgers rest for at least 10 minutes and up to half an hour. Make a note of which side of the burgers is facing up during resting and let's call this side A. Side A will be dryer than Side B and should be seared first for maximum browning and superior appearance. Before searing the burgers, have your toasted buns and condiments ready to accept it. Preheat a cast iron or stainless steel skillet over with 1 tablespoon / 15 ml of oil over high heat until the oil starts to lightly smoke. Add the burger patties with Side A facing down and add 1 tablespoon / 15 ml of unsalted butter. 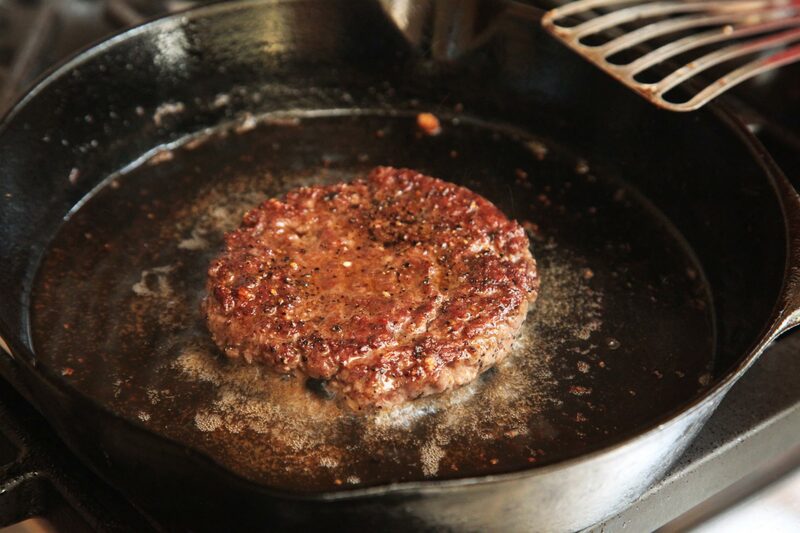 Butter contains milk solids that will blacken and char, helping your burgers achieve a dark crust much faster. Cook the burgers, swirling the pan to distribute the butter, until well browned on the first side, 45 seconds to 1 minute. Flip the burgers and add a slice of cheese to the top surface (if using). Cook until the second side is browned and the cheese is melted, 45 seconds to 1 minute longer. 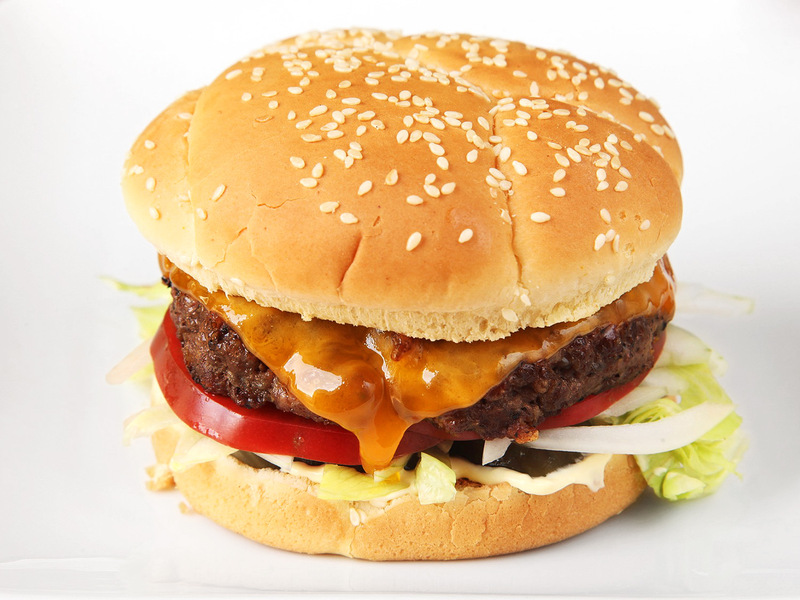 Transfer the burgers to the prepared buns, add toppings as desired, and serve immediately. Before searing the burgers, have your toasted buns and condiments ready to accept it. Light one chimney full of charcoal (about 5 quarts / 5 L of coals). When all the charcoal is lit and covered with gray ash, pour out and arrange the coals on one side of the charcoal grate. Set cooking grate in place, cover grill and allow to preheat for 5 minutes. Alternatively, set half the burners on a gas grill to the highest heat setting, cover, and preheat for 10 minutes. Scrape the grill grates clean with a grill scraper, then oil the grates by holding an oil-dipped kitchen towel or paper towels in a set of tongs and rubbing them over the grates 5 to 6 times. Place the burgers directly over the hot side of the grill and cook until a deep, rich crust has formed, about 45 seconds to 1 minute. Flip burgers and add cheese. Cook until the second side is browned and the cheese has melted, 45 seconds to 1 minute longer. If the fire threatens to flare up as the burgers drip fat into it, suffocate the fire by closing the grill lid until the flames die out. Alternatively, transfer the burgers to the cooler side of the grill using a long spatula until the flames subside. Do not allow the burgers to get engulfed in flames.